Race date and start time: Sunday 25 March 2018, 9am. Entry Fee: £24 SAL registered, others £26. No refunds will be offered in the event of a runner being unable to compete. Race numbers will be posted to competitors prior to the event. There is no registration on the day. Location: A point to point race starting in Pier Road, Balloch G83 8QX near the junction with Balloch Road and finishing in Seaforth Road, Clydebank (the service road for the Clyde Shopping Centre). 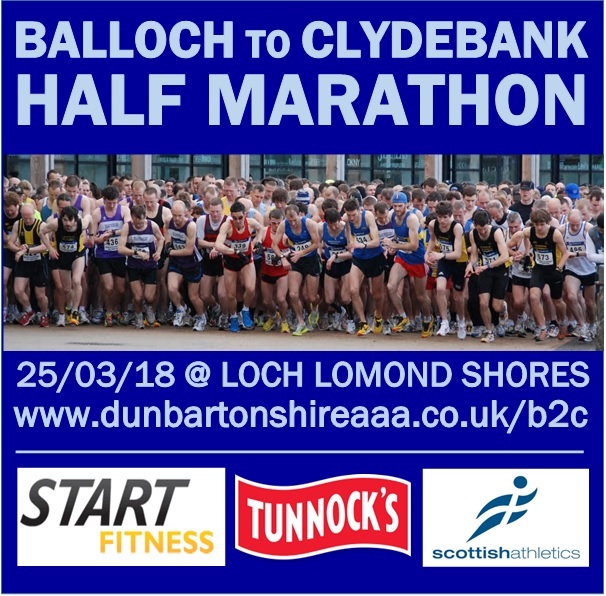 The Entry Fee includes transport from Clydebank Leisure Centre, Garth Drive, Clydebank G81 1BF to Loch Lomond Shores, Balloch. Buses will depart no later than 8am. Runners should arrive changed and ready to run as there are no changing facilities available prior to the start of the race. The start is approximately 1 kilometre from Loch Lomond Shores. The course is mostly flat with minor inclines on the cycle path between Dumbarton Gateway Services and the Dunglass Roundabout and between Bowling and Old Kilpatrick. The course is not suitable for wheelchair athletes. Prizes: Prize vouchers for first five males and females plus age group prizes. Results will be added to the Dunbartonshire AAA website. If there is adverse weather on the day the race will be rescheduled with advance notice if this is possible. There will be no refunds just transfer to the alternative race date. This race is a Scottish Athletics Limited permit event held under UK Athletics Rules. All entries must be made through Entry Central. Entries close on 15th March 2018 or earlier if the race limit of 500 runners is reached. There will be no entries on the day.